The November meeting of the W.C.T.U. met with Mrs. C.S. George, on November 17 1925. The president called the meeting to order and open the session by singing Some Glad Day. Mr. and Mrs. A.J. Fryhoff formed us with a Jesus of Galiler duet. Mrs. Fryhoff took charge of the devotional scripture was read and prayers followed. Mrs. Griffith and Mrs. Hess reported one thousand blotters were distributed among the pupils. The home sent a letter of appreciation for the [fruit?] sent them by the Union. The [illegible] $41.00. 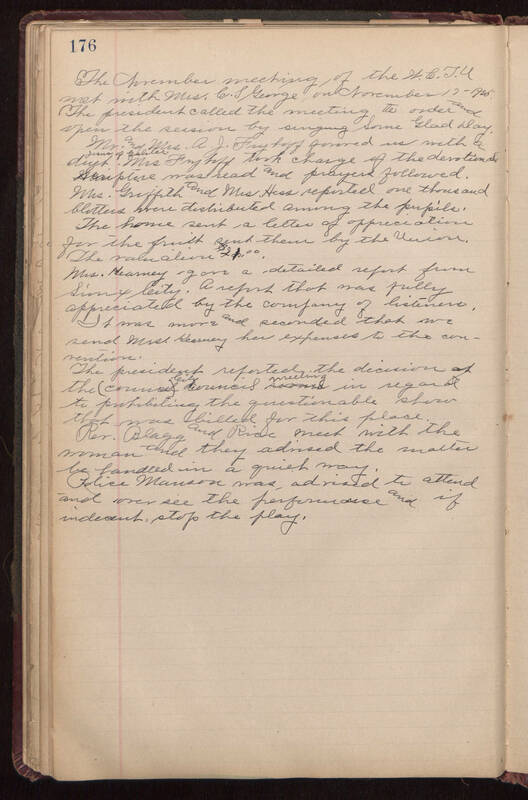 Mrs. Hearney gave a detailed report from [illegible] by the company of listeners. It was move and seconded that we send Mrs. Kearney her expenses to the convention. The president reported the decision of the [illegible] council meeting in regard to prohibiting the questionable show that was billed for this place. Rev. Flagg and Rice meet with the woman and they advised the matter be handled in a quiet way. [Police?] Manson was advised to attend oversee the performance and if indecent stop the play.